Maglula Baby UpLULA .22LR to .380ACP Single-Stack Without a Projecting Side Pin. The BabyUpLULA is a high-quality pistol magazine loader and unloader designed for loading virtually all* .22 LR to .380 ACP (9mm Short/Kurz) single-stack narrow-body <1/2? mags which have normal / moderate angle of lips. It does so easily, reliably, and painlessly. - Loads .22LR, .25, .32 and .380ACP cal. 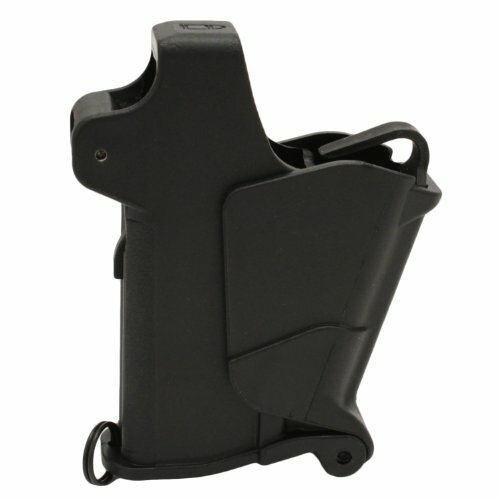 single-stack narrow-body pistol mags of all manufacturers, having: width of mag less than 1/2? (including any side-button), and egular / moderate angle of lips (unlike Ruger's MK series mags). - Easy loading; the rounds just drop in with no fingers pushing or pressing them. - Has a simple rounds' unloader feature too. - Protects your fingers and mags. - Up to one round per second loading rate. 1/3 the time loading mags compared with thumb loading. - Fits in hand and pocket, weights approximately 42 grams (1.48 ounces). - Wide-body mags. > 1/2" , like Converted .22 mags. Loads .22LR, .25, .32 and .380ACP* cal. single-stack narrow-body pistol mags of all manufacturers, having: width of mag less than 1/2″ (including any side-button), and regular / moderate angle of lips (unlike Ruger's MK series mags). Highly durable. No inserts, spacers, or adjustments at all! (One SKU) Easy loading; the rounds just drop in with no fingers pushing or pressing them. No more pain! Load hundreds of rounds, painlessly. Has a simple rounds' unloader feature too. Protects your fingers and mags. Up to one round per sec. loading rate. 1/3 the time loading mags compared with thumb-loading. If you have any questions about this product by Maglula ltd., contact us by completing and submitting the form below. If you are looking for a specif part number, please include it with your message.